This page Showcases our Teaching Staff & all of the Volunteers that help us here at The White Crow! THE WHITE CROW WELCOMES DENNIS LOWE to our STAFF! Dennis Lowe brings a lifetime of honoring Scottish musical tradition on the great Highland bagpipes. He grew up listening to bagpipes and Scottish song in his home environment. Recruited by his elementary music teacher to join the school band, he agreed only if he could play the bagpipes. Playing pipes since he was fifteen, his leadership and teaching abilities were recognized almost immediately as he was asked to become the pipe major of his first pipe band after only three years of playing. He played for the Sons of Scotia pipe band (no longer in existence) for ten years, serving as pipe major for five of those years. He played with the Windsor Police Grade 3 and 4 competitive band for two years before being asked to lead the Windsor Police Grade 5 band as pipe major for four years. He just recently led the Flint Scottish Pipe Band as their pipe major for the last eight years. 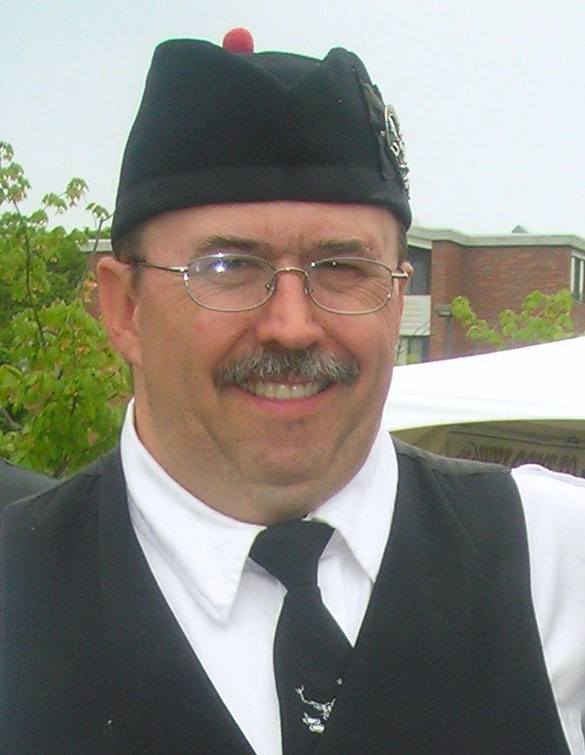 During his time as pipe major, his bands won the U.S. Open Grade 4 and Grade 5 championships, the North American, the Canadian Open, the Ontario SE Open, and the Atlantic Open championships. He is presently traveling the state playing pipes and hand percussion for the Celtic band, EQUINOX. Dennis has been teaching students to play highland bagpipes for the past thirty years. Focusing on teaching students proper technique and good musical expression, he believes it is better to learn to play a few tunes very well than to play many tunes poorly. The bagpipes are not an easy instrument to learn, but are well worth the effort. Dennis has taught students of all ages, from seven to sixty-seven. Students begin with instruction on a practice chanter (approx. $50) and the College of Piping tutor book #1. Students who are diligent will be ready to move from the chanter to the full bagpipes (chantor and drones) in a year or less. This year allows students to determine if aptitude and interest are present before investing in a full set of pipes (a major investment). After this year, students will be prepared to continue one-on-one instruction, to enter the world of competitive solo piping and pipe bands, or to begin learning tunes as a ceilidh piper. Students could also choose to move on to playing other types of pipes such as uilleann (Irish) pipes, border or parlor pipes, etc.